How do the doctors of the Washington Bunion Center treat bunions? Depending upon the severity and progression of the disorder non-surgical options are typically preferred. If left untreated bunions will progress and typically become increasingly painful. 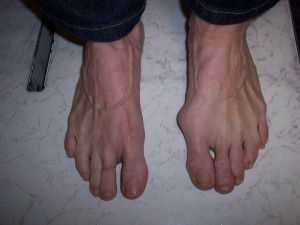 This can cause restricted or painful motion of the big toe (small toe for a Tailor’s bunion) resulting in decreased activity levels, inability to wear common footwear and the development of corns. After an evaluation of a patients bunion(s), sometimes observation of the bunion is all that’s needed. To reduce the chance of damage to the joint, periodic evaluation and x-rays may be recommended. However, in many cases some type of treatment is needed. Early treatments are aimed at easing the pain of bunions, but they won’t reverse the deformity itself. Some of these treatments include wearing proper fitting footwear, avoiding narrow pointed shoes, or the addition of padding to footwear. Padding and taping will provide some cushion to the area and may reduce friction, swelling and sensitivity. Orthotics or shoe inserts can provide relief. However, prescription orthotics are often more helpful. These prescription orthotics are made specifically to address your unique issues that many of the over the counter orthotics cannot address. Modifying activities that aggravate this condition may be necessary, ice and anti-inflammatory medications can help with swelling and pain. Non-surgical treatments are preferred by both doctor and patient and there are a variety of devices and treatment options available. The best way to relieve the pain and take steps to address the progressiveness of the disorder is to have your bunion(s) evaluated. As the bunion continues to progress untreated non-surgical treatments become less effective. Protective padding, often from felt materials, to eliminate the friction against shoes and help alleviate inflammation and skin problems. Orthotics are used to help stabilize the joint and place the foot in the correct position for walking and standing. If a bunion disorder progresses to the point when surgery is needed, what are the options? Severe bunions may need to be surgically corrected. A variety of surgical procedures are available to treat bunions. Surgical procedures are designed to remove the “bump” of bone, correct the changes in the bony structure of the foot, and correct soft tissue changes that may also have occurred. The goal of surgery is to reconstruct the foot and therefore reducing pain. Visit our bunion surgery page for more information about this form of treatment.